Epoxy resins are an incredibly versatile family of substances which are found in a large variety of industrial and everyday applications. Yet, their value to European consumers and businesses is often little known and their widespread economic value is not well understood. Downstream users in the energy and electrical sector account for the largest consumption of epoxy resins, with about 69,000 tonnes or 26% of total production. Construction is the second-largest sector, accounting for 60,000 or 23% of all epoxies manufactured. 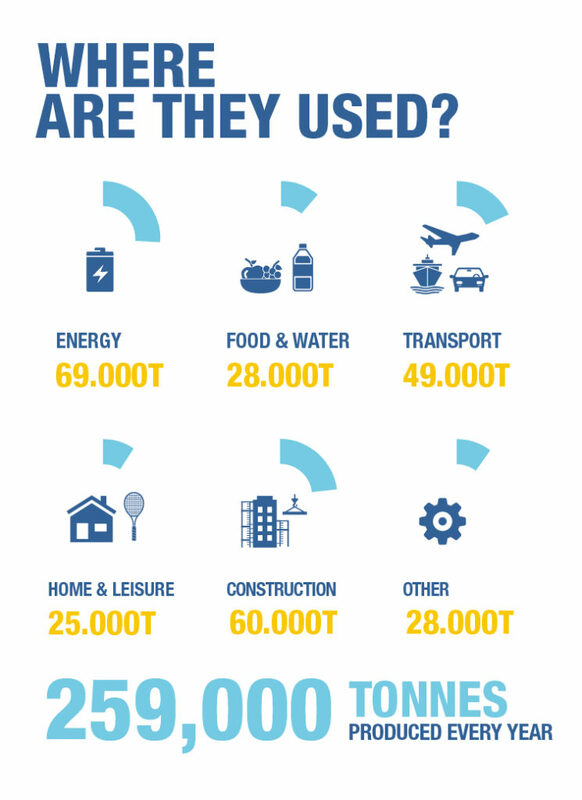 49,000 tonnes of epoxy resins (or 19%) are used by the transport sector, whilst the food and water and home and leisure sectors use around 25,000 tonnes (about 10%) each. Members of the Epoxy Resin Committee manufacture about 258,000 tonnes of epoxy resins per year. Overall sales amount to around €806 million on European markets, led by Germany (88,000 tonnes or 35% of all sales), United Kingdom (27,000 tonnes or 11%), France (24,000 tonnes or 9%), Spain (18,000 tonnes or 7%) and others. Energy and electrical: Around 50% of the current wind turbine market uses epoxies as infusion resins for the manufacturing of blades, providing them strength, durability and lighter weight. Epoxy resins make it possible to produce long wind turbine blades, thus increasing the EU’s renewable energy production and exports. Epoxy resins in energy distribution systems – sealants, coatings, adhesives, transformers, insulators, printed circuit boards and many others – contribute to long-lasting and reliable components. Without epoxies, electric systems would cost more, break more often and generate larger amounts of waste. Construction: Often used in small quantities, epoxies enable many internal and external construction activities. Millions of large and small enterprises across Europe enjoy the use of epoxy resins in easy-to-clean flooring, resistant and affordable mechanical fixings, etc. Epoxies increase flexibility for interior designers and builders while lowering initial costs as well as maintenance. Transport: Cathodic Electro Disposition (CED) allows cars, trucks and motorcycles to last longer than ever, making bodyworks more resistant to deterioration and rust. For under the hood and interior parts, epoxy-based composites lower weight and increase mechanical strength, reducing maintenance needs, fuel consumption and CO2 emissions. The use of epoxy resins ensures that the European vehicle manufacturing industry remains competitive and produces affordable cars. Railways apply epoxies to replace steel in gear casings and other parts to reduce weight, and improve service life by preventing damage from debris or corrosion. Similarly, epoxy provides excellent corrosion resistance which reduces the need for repair and maintenance in boats. In the aerospace industry, epoxies allow for greater use of composite components, improving durability, efficiency, strength and reliability. It is estimated that by using less fuel, epoxy composites contribute to saving some 720,000 tonnes of CO2 aircraft emissions per year. Food and water: Epoxies are applied to food cans to prevent corrosion and prolong shelf-life, resulting in the production of a smaller quantity of food waste. Other packaging materials – such as glass – would result in higher prices for consumers. In processing machines, epoxies shield foods from being tainted and vice versa, improving hygiene standards and lowering maintenance costs. Epoxy resins prevent corrosion and leaks in steel and concrete composite pipes and tanks. Without epoxy resins, road works to fix water pipe damage would last longer and cause greater traffic jams. Home and leisure: Epoxy resins reduce weight, increase responsiveness and extend product lifetime in a number of sports kits fabricated in Europe. They are also sold as sealants, adhesives and mortars to repair wood and plastic resulting in strong, durable and resistant repair joints. You can read more about how to correctly handle epoxy resins in our Consumer Safety section. Members of the Epoxy Resin Committee (ERC) produce epoxies in factories located in Germany, Spain, the Netherlands, the Czech Republic, Poland, Switzerland. These factories employ about 2,500 full time workers. Some of the downstream industries which make the most use of epoxy resins – wind energy, construction, food manufacturing – are among the EU’s largest sectors of employment and support hundreds of thousands of jobs. ERC members invest nearly €16 million in R&D activities each year, collaborating with universities and other academic and research organisations on product development, life cycle analysis assessments and many other topics. Many sectors would be affected if regulation authorities decided to ban, phase out or limit constituent substances of epoxies such as bisphenol A (BPA). Epoxy resins would be replaced by more expensive and lower performing alternatives which have not yet been tested as extensively as BPA for potential health and environmental hazards, while the European Food Safety Agency (EFSA) and the US Food Safety Agency (FDA) have declared BPA safe for use in all current food contact applications. 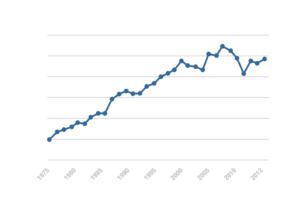 Production and sales data of epoxies originate from a survey by ERC members on their 2013 activities. Other data originate from recent publicly available information and express average annual values. Based on wider market research, the overall annual consumption of epoxy resins in Europe is estimated to be around 325,000 tonnes, of which over three quarters refers to Western Europe. More information about each sector can be found in ‘The Socio-economic Value of Epoxy Resins’, 2015.